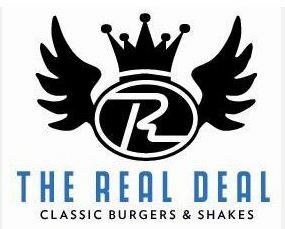 The Real Deal is a brand of burger shops which just opened up in the Kalamazoo area (where I go to school). They currently have two locations where they serve hamburgers, hot dogs, fries, and milkshakes. The Real Deal has a focus on building your own burger, and as such features a number of free toppings, including lettuce, tomatoes, onions, jalepenos, BBQ sauce, pickles, and more, as well as premium options like bacon and cheese. Unfortunately, there aren't many pictures online of their burgers. Their website does have a nice one though, so check that out. I had a classic burger, which comes with two patties. I tricked it out with bacon, grilled onions, and some barbeque sauce. It was delicious. The patties are fresh, grilled to perfection, and huge. It’s a pretty filling burger. While I generally have a problem with “build your own” type meals, mainly because they force the customer to provide the vision as opposed to the restaurant (I’m looking at YOU, Subway), burgers are simple enough that you can design the flavor combinations you want without much effort. The fries, which are fresh-cut, are also fantastic, as are their milkshakes. The one possible snag regarding The Real Deal is the price. If you ordered a burger with some higher-quality ingredients, an order of fries, and a drink, it could be in the neighborhood of $8-$10. They give you a ton of food, between the enormous burger and the pile of fries, so it’s not a bad deal, but it’s something to keep in mind. That said, I give two thumbs up to The Real Deal. Check it out if you’re interested in high quality, tasty burgers.